The Sprue Posse Invitational is an upcoming event that will determine our player of the year. It is our ultimate playoff for the 2010 season. A meeting of all of the best performers of our open events. This tournament will be located at Aero Hobbies and Games in Santa Monica, California. This is an invitational tournament and we are extending invites to only the best performers of our tournament circuit for 2010. The Sprue Posse invitational is an 8 slot tournament with seeded pairings. Invitations are granted to individuals who win a sanctioned Sprue Posse event. Leftover slots are given to individuals who qualify based on their ELO rating. ELO rating is a ranking system used in a number of different competitive games like Chess or Magic: The Gathering. Players are awarded points based on victories and docked points based on losses. Beating higher ranked opponents results in great point awards. Full standings are located here. Players with tournament victories are guaranteed a slot. The remaining players are given an invite if they maintain the highest rating to qualify for the remaining slots. Below is the current invite list, note this list is subject to change depending on the outcome of our two remaining open tournaments. Unlike our open tournaments where the first round pairings are selected randomly, this is a seeded tournament where the top ranked player will meet to lowest ranked player in the first round. The second rank will meet the seventh rank. The third rank the sixth and so on. 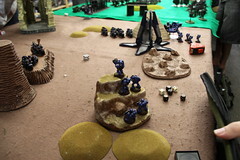 It is a 2000 point tournament. The format for the Sprue Posse Invitational will be standard book missions randomly selected on the day of the tournament. INAT FAQ will be used, and unpainted WYSWYG models allowed. When are formal invitations being extended? We will extend formal invitations to this tournament after our last open tournament of the year at the end of October. Since this is an invitational tournament, entry is free. What is the prize support? This tournament is a winner take all best general tournament. Prize support will be generous product offering along with a trophy or plaque. My name isn't on the invite list. How do I change that? Come out and participate in our two remaining open tournaments and either win them outright or win enough games to push your rating high enough to get an invitation. 2 Response to "Playing: Sprue Posse Invitational FAQ"
You bet Hulk! I actually need to chat with you regarding a GW contact that I wanted to get into conversation with. The ultimate goal for this tourney format is a GT. But that's a ways off. In the meantime we'll keep hosting highly competitive RTT's and hopefully let the invitational we put together be the best compilation of competitive players in the region.